3. 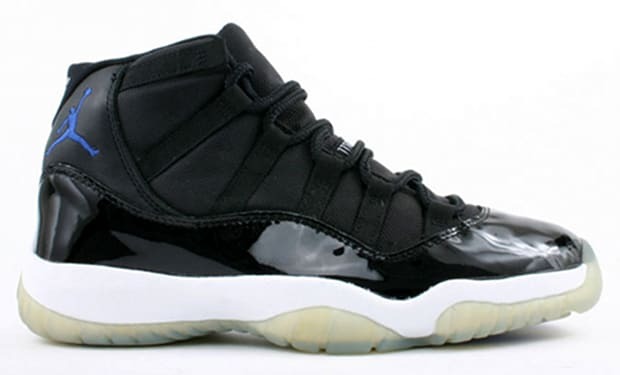 Air Jordan XI "Space Jam"
Rumors circulated that only five or six pairs were known to exist until 2000 — when fans first saw these they weren’t on the court but rather in the movie "Space Jam," hence the nickname. (Although technically they should be called the "Nick Andersons," since MJ premiered them on the low in the '95 Playoffs.) The few pairs that were available back in the mid '90s had the "23" stitched on to the heel, while the retroed version saw an ironed on number. The all-black upper paired with an icy sole and royal blue hits on the Jumpman and outsole make them an easy sellout every time they re-appear.